Captains Greg Snow and John Tondra are fully insured and licensed USCG captains. Capt. Greg says, "My earliest memories are fishing for catfish off my neighbors dock with dough balls, I was about 3 years old and I've been fishing ever since". Greg's passion for fishing and being on the water is evident to every client that steps aboard his 23' Custom Sea Craft. " Fishing is not so much what I do, it's who I am". Capt. Greg is a patient guide who loves to teach men, women and children how to find and catch fish. 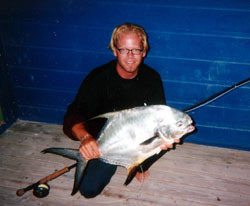 Greg has been fortunate enough to fish all over the world in such places as every country in Central America, all the Hawaiian Islands, the Cayman Islands, all of the U.S. Virgin Islands, 7 Bahamian Islands and the coastline of every state from Mississippi to Maine. Greg is an avid conservationist who believes in releasing ninety-nine percent of all fish caught (especially striped bass). 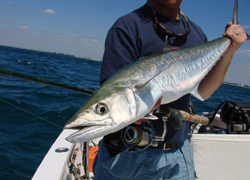 Rhode Island regulations state that each angler may keep two fish per day over 28 inches. Capt. 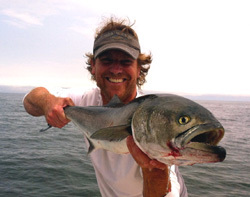 Greg encourages all of his clients to keep no more than one striped bass per day between 28 & 35 inches. All fish over 35 inches are breeding females which have been devastated in the past few years. Please help conserve this precious resource! Ever since John was born he has been immersed in fishing. His earliest memories are of being strapped into a backpack with his father fishing for trout in the Croton Watershed in Southeastern New York. Later he was taught how to ride a bike, and you would find him cruising around Sanibel Island with rod in tow, casting the shores for Sea Trout, Redfish, Snook... and what were those human sized beasts coming up for air that scared him out of the water? His present day passion... TARPON! In the late 80's John's family started spending a lot of their summer time in Montauk. In the early 90's he landed his first job working as a mate on a 57ft Viking. From there it was full steam ahead! He went back and forth from working on charters and private boats, grabbing his fly rod after work, casting the flats and rocks all around Montauk and the Hamptons. In 2004 John bought his first boat and started guiding. 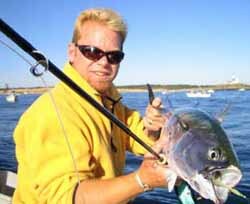 His 30 years experience with rod and reel brought his clients to the flats in spring, offshore for Tuna, Shark and Maui in early summer, and to the coast line of Rhode Island and Block Island in mid to late summer. And of course, every year, the Fall run off Montauk and Block Island sound. John is one of the most well rounded fisherman around--whether it's fly, spin or dropping bait, he will work like a Hound dog to catch you fish! Greg at Montauk Pt. with a Fly Rod Albie. Capt.John always enjoys the water. Captain Greg with a nice Bluefin. In Belize where Permit are everywhere. 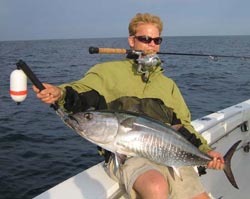 I love catching kingfish on fly and light tackle.